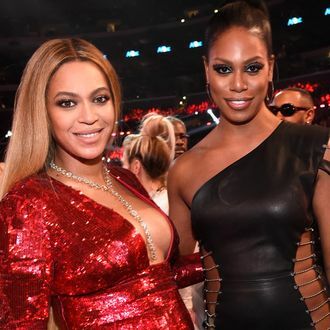 After meeting for the first time at the Grammys, Laverne Cox and Beyoncé are working together on a new project. The Orange Is the New Black actress revealed the upcoming collaboration on Access Hollywood, telling the hosts, “I’m like, does she pick out her biggest fan ever and work with her? It’s pretty amazing.” Though she didn’t let on to the nature of the team-up, we expect with the outspoken trans-rights activist and Queen Bey onboard, it’ll probably inspire empowering memes and hot takes for weeks after it’s released. In an Instagram post, Cox promised more details on September 6.